PARKING: We ask that you drop everyone at the park with the items you need for the day. Drive to Saint Barnabas Church, 6715 N Mockingbird Lane, Paradise Valley, AZ and park your car. We will have two 15 passenger vans that will return you to the park. It is less than a one mile trip. We are unable to transport car seats, wheel chairs, etc. so please drop your passengers at the park before you go to Saint Barnabas. It is necessary that we do as much off-site parking as possible as the retailers across the street will not allow parking during their business hours. The event is designed to honor and provide a fun day for special needs children and their families. It is totally free for the kids and their families, the admission, the rides, the fair and the food are offered by the Scottsdale Sunrise Rotary Club. The event provides free train and carousel rides, games with prizes, hot dogs, chips, ice cream, and beverages for all. D-Back's Big Red from the Cardinals. Booths with games and face painting which adds to the fun and enjoyment by all. Raising Special Kids assisted the Scottsdale Sunrise Rotary Club in getting the news out to all families in Arizona on the date of the event. Food and beverages are donated by Denis & Donna Weinhoff, KIITA Foundation, Forever Living, Albertson's, Frito-Lay, Shamrock Foods, Redi-Ice, Gatorade-Pepsico, and BHHS Legacy Foundation provided baseball hats. McCormick-Stillman Railroad Park donated the use of the park and the Mechanical Society Train Museum and Live Steamers donated rides on the trains and carousel. Without the donations from our sponsors, it would not be possible to sponsor this event. The 2018 event attendance was approximately 2,600 and we were blessed with perfect weather. 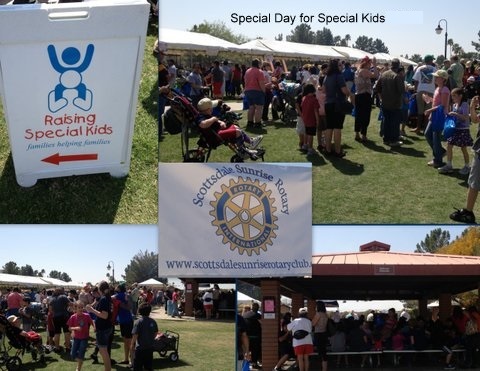 The Scottsdale Sunrise Rotary Club is assisted by Raising Special Kids, ASU Rotaract Club, Saguaro Interact Club, Boy Scout Troops #649 and #30, and many other service organizations. The event is funded through an annual golf tournament and raffle sponsored by the Scottsdale Sunrise Rotary Club at Starfire at Scottsdale Country Club. E-mail Neil Sutton at neil.sutton@desertsunmortage.com to find out how you can participate and support this great event.